Dal is the Indian name given to lentils or beans. In India you can find a huge variety, and many more delicious savory concoctions made from them. When I visited the country, I was astounded at the depth of flavour that could be found in a dal; they were undeniably tasty, and had a powerful savoriness that I had previously thought wasn’t possible in a dish with no meat. As lentils and beans are relatively inexpensive, they are used in everyday meals for lunch and dinner. 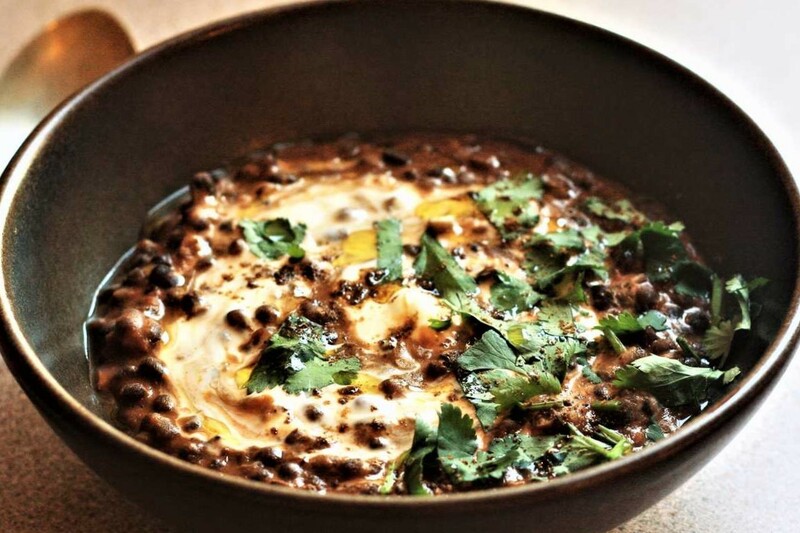 This dal, made from black urid beans however, is a bit more special. Due to the toughness of these beans, they must be soaked for several hours, then slowly simmered over a gentle heat for several hours more. Of course, a customary mixture of garlic, onion and spices is added to the mixture, and the result is a dark earthy bean stew that has a hint of smokiness. It’s very rich, there’s no denying it, so I have finished it with a swirl of yoghurt and some freshly chopped coriander. Drain the beans and rinse. Place in a pot and add water until just covered. Add ½ tsp salt, then bring to the boil, skimming off and discarding all the scum that rises. Simmer gently for 45 mins, topping up with water if necessary. While the beans are simmering, add the 30g of butter to a separate pot and place over a medium heat. Once the butter has melted, add the onions and ¼ tsp salt. Turn the heat to low and fry gently for 20 minutes until soft and sweet. Add the garlic and ginger and continue to cook for a further 5 minutes. Now add the tomato puree, cayenne pepper, asafoetida, ground cumin, ground coriander. Stir thoroughly and cook for a further 5 minutes on a low heat. Now add the beans, the remaining ½ tsp of salt 300ml water. Bring to the boil, then turn to a gentle simmer and cook, stirring frequently, for 2 hours, topping up with water if necessary. By the end, it should be dark in colour and fairly thick; almost but not quite as thick as porridge. To finish, add the 15g butter and mix vigorously to thicken the dal. If, at this point, it seems too thick just add a splash of water. Mix the yoghurt in at the last second to create a marble effect. Roughly chop the coriander and scatter over, along with the garam masala.